The first time I attended SIIM (it was actually still SCAR in 2004), the meeting was more about making PACS work than making it work for you. Since then the field has grown up and out across the enterprise. The meeting has evolved from a radiology department PACS users group to an enterprisewide imaging event that focuses both on the nuts and bolts of acquiring and using digital images and bigger picture trends in the field. With that in mind, this month’s E-News Exclusive focuses on five things at SIIM 2013 that may suggest the direction the field is headed. Society for Imaging Informatics in Medicine (SIIM) annual meetings offer an always-interesting look at what’s happening and what’s likely to happen in radiology from the imaging informatics perspective. Radiology Today will be attending SIIM 2013, and the following is a preview of what we think some of the most interesting topics will be at this year’s meeting in Grapevine, Texas. Moderated by Radiology Today Editor Jim Knaub, join industry leaders in an informative session describing a better approach to image sharing with a solution that: addresses the entire image workflow process to exceed expectations of external and internal providers, installs quickly and easily with a software-only option for smaller providers, and makes medical images part of the entire patient record. 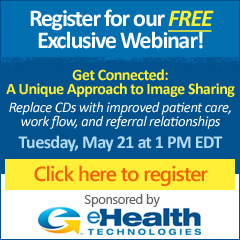 By attending the webinar, you'll also receive a complimentary White Paper, "Image Workflow and the Referral Process: Integrating Image Workflow and Patient Referrals." Click here to register. In addition to receiving this insightful, in-depth White Paper, all attendees of this webinar will also be eligible for a drawing for a $100 American Express Gift Card, courtesy of our sponsor, eHealth Technologies. Drawing is subject to these Official Rules. Companies are developing apps and medical devices that can connect to smartphones, allowing users to track their health without ever visiting the physician’s office, USA Today reports. Danish chemists reported that the imaging contrast aza-oxa-trangulenium is cheaper, easier to use, and has a longer light-life for clearer images compared with current dyes, according to ScienceDaily.com. Physicians at Children’s National Medical Center in Washington, DC, are using images from CT scans and ultrasounds, and a 3D printer to construct a plastic replica of their patient’s hearts to help solve cardiac problems, The Washington Post reports. An article by The Baltimore Sun focuses on one chronically ill patient’s story about her many visits to a federally funded health clinic that is struggling to keep prices down as the health care system is being overhauled.